If Americans suddenly doubled their demand for vodka it would take the vodka makers only months, or at most a year or two, to increase their supply to match the new demand. Not so for bourbon. When the public suddenly wants more well-aged bourbon, increasing distilling capacity today won’t do anything to change supply for a decade. I.W. Harper has an interesting and complex story. Originally introduced in 1879, the brand was discontinued in the U.S. market around 1990 but continued to thrive in the Japanese market. I.W. Harper is owned by Diageo, the largest spirits company in the world, but a company that has a long, though often puzzling, history in the American bourbon market. Currently, Diageo’s American whiskey portfolio consists of George Dickel, Bulleit, and the Orphan Barrel series. This bourbon was distilled at the New Bernheim distillery, which is currently owned by Heaven Hill, owner of Elijah Craig, Evan Williams, and many other brands. The mashbill used is 86% corn, 6% rye (a very low rye percentage), and 8% barley and it is bottled at 86-proof. Suggested retail price is $75 a bottle, although you might see it anywhere from $60-90 in a throwback decanter-style bottle that is certainly eye-catching. Inside is a bronze-colored bourbon with a nose of vanilla, cotton candy, brown sugar, and fresh corn. It starts out light on the palate with lots of sweetness, apples, and a little creaminess, but it also shows a bigger, thick woody edge. The finish is long with more oak and spice. The low rye content of the I.W. 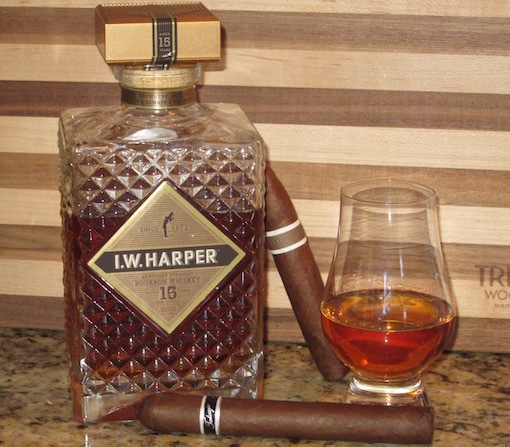 Harper 15, combined with the relatively low 86-proof, creates a soft, complex, finessed bourbon, especially given the age. It pairs well with a mild cigar. Think a creamy Connecticut Shade. Good, old bourbon is increasingly hard to find at a reasonable price, and the I.W. Harper fits that description. In addition, it would make an excellent gift. The seasoned bourbon drinker will appreciate the juice, but a more novice bourbon fan can still appreciate the fancy bottle and relatively old age (which, rightly or wrongly, is often seen as a indicator of quality).